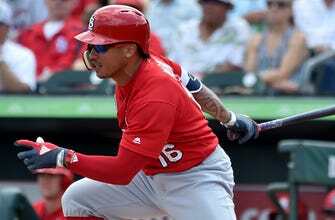 JUPITER, Fla. — Kolten Wong has six steals during in spring training — two shy of his total during the 2017 season. Wong has 53 regular-season stolen bases, including 20 in 2014. At one point projected a leadoff hitter, he likely will bat eighth when the season starts. “I think I can still be aggressive — balls in the dirt, going first to third, different situations,” Wong said. He knows he needs to get on base more. He’s hitting .176 in spring training after going 1 for 2 with a walk in Thursday’s 8-2 victory over Atlanta. Manager Mike Matheny notices the difference. “I think he’s handling things better, and to me that’s maturity,” Matheny said. Wong hit a career-high .285 last year but had four homers — his lowest total for a full season — and his eight stolen bases.